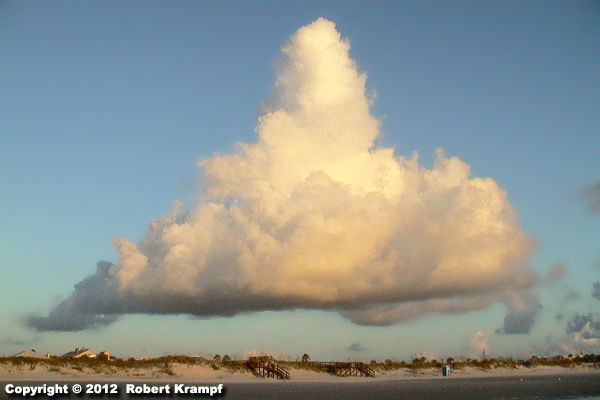 Which of these processes forms the VISIBLE part of a cloud? No. Evaporation changes liquid water into water vapor. Water vapor is an invisible gas, so it is not the visible part of the cloud. Yes! Condensation changes water vapor into droplets of liquid water to form the cloud. These are just like the tiny water droplets that form fog, letting you see the cloud. No. Precipitation can fall from a cloud, but it is not the process that forms the cloud. No. Convection carries the water vapor upwards so it can cool and condense, but condensation is what forms the visible part of the cloud.